Signal to Noise returned in May for another wall-rattling, late-night art party, activating every area of the Museum of the Moving Image once again with fresh local tunes and visualists, web video showdowns, personally tailored playlists, performed cinema, booty shaking beats, and much more. The World Series of ‘Tubing issued iPads and laser pointers for an evening-long augmented reality game show, featuring Peter Berkman (Anamanaguchi), Paddy Johnson (Art Fag City), Ryder Ripps (dump.fm), and Ellie Rountree (Rocketboom), hosted by Julian McCullough. Bruce McClure overwhelmed the senses with live multi-projector spectacles, and Matt Wellins and Sarah Halpern time warped Ektachrome. 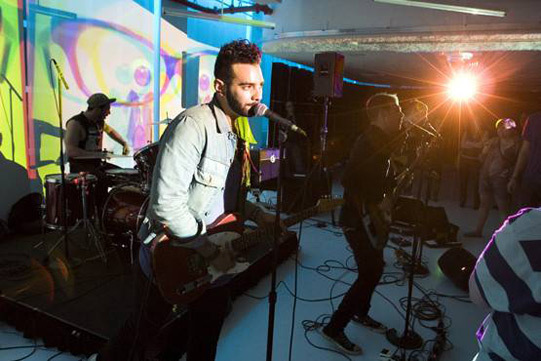 The So So Glos dazzled with updated indie pop punk and Shark? blasted unquestionably catchy lo-fi melodies, while Holly Danger braved the visuals. Bubblyfish wielded her Gameboys and The Shortsleeves brought the synth, with No Carrier on the eyecandy. Marius Watz simulated magnetic forces, and Dan Iglesia oscillated in an extra dimension. Back by popular demand, DJ $mall ¢hange and special guest Repoman held down the dance floor, and if you still weren’t amused, AutomaticDJ knew your face and played your favorite songs.